Microsoft today briefly previewed an Office application designed for the Windows "Modern," ne "Metro," user interface (UI), and said it would launch the touch-enabled suite next year. "This is big," said Frank Gillett, an analyst with Forrester Research. The company later confirmed that the new Office apps will not appear until 2014, but declined to provide any additional information, whether a narrower release window or pricing clues. The brief glimpse of PowerPoint, one of the core applications in Office 2013, was offered by Julie Larson-Green, the head of Windows development, during her time on stage today at BUILD, Microsoft's developers conference. She dubbed it "a preview of an alpha," hinting that its status was extremely preliminary. The app will run on devices powered by either x86 or ARM processors -- in other words, on either Windows 8 or Windows RT -- and will be available from the Windows Store. Currently, the only "Modern-ized" -- or for those who can't let go of the original name of the tile-style UI -- "Metro-ized" Office apps are the four now bundled with Windows RT, and the Lync, OneNote, SharePoint and Yammer apps already in the Windows Store. But even those are first-generation apps that have, at best, a light layer of touch, said Gillett. "The [Modern] Office apps are a completely different animal than those now on Windows RT," he said, pointing to the bundle of Excel, OneNote, PowerPoint and Word included with the limited-feature spin-off of Windows 8. "Those are not touch-first, they're retrofitted with touch." As Microsoft intimated, however, the new Office apps will be designed from the ground up for Modern and touch. Beyond that, however, little was certain. Larson-Green said virtually nothing about the apps' features or editing prowess, limiting her demo to a few moments of PowerPoint slide transitions. "There's no indication of what these will look like or how they will work," said Wes Miller, an analyst with Directions on Microsoft. More important than the particulars of the apps' functionality, said the experts, was the signal Microsoft gave by simply mentioning them. "This shows that Microsoft is fully committed to the Modern interface," said Gillett. "They're taking their most powerful and far-reaching application -- Office -- and making it Modern. There were always question marks about their commitment [to Modern] because people could say, 'If you're so serious about it, why haven't you moved Office to it?'" Patrick Moorhead, principal analyst at Moor Insights & Strategy, completely agreed. "This was a definite signal that Metro is the future development environment for Windows," said Moorhead. "Microsoft's most profitable and highest-revenue application is going Metro.... That says it all. If there was any doubt in anyone's mind that Metro is the future, there should be no miscommunication now." Minus any comment from Microsoft, the pricing and licensing of the Office Modern apps was unknown. The company could charge for each app, but its current practices make that a longer shot than the alternatives: Tying the apps to an active Office 365 subscription, as Microsoft did when it released Office Mobile for the iPhone earlier this month, or bundling it with its own in-house hardware, as it does now with Office on the $499-and-up Surface RT tablet. But analysts applauded even the glimpse Microsoft gave today. "Microsoft left a huge vacuum when they announced Office 2013 without any mention of when they'd make a Modern version," said Gillett. "It was as glaring a gap as not offering Office on the iPad. One down, one to go." Wes Miller, of Directions on Microsoft, called it "just a tease" because of the many unanswered questions. He did note, however, that, "It's good to know they're making some progress on [Modern Office]." Miller was willing to speculate on the likeliest path Microsoft would take. "Look at the way they make Office Web Apps work," Miller said, talking about the free, online versions of Excel, PowerPoint and Word. "They can be used for editing, but at a certain point you need a feature that's not available, and you have to turn to the desktop. I think the same thing will be true for Office on Modern. A set of features that they decide are key will be there, but you're not going to want to write a book with Word." Gillett had a slightly different take. "I would never expect Microsoft to use this in their marketing, but I think you could call it 'Office Lite,'" He acknowledged he was in the dark as much as anyone outside Microsoft, but still argued for that moniker. "It needs to be something more streamlined and straight-forward," said Gillett, describing apps that "would let you work all day" but not get users bogged down in the complexity of Office on the desktop. Moorhead saw them as closer to Office Web Apps than either Miller or Gillett. "I think they'll be good for viewing and some light editing, but still viable productivity apps on a smaller tablet," Moorhead speculated. As for a release timeline, only Gillett offered an opinion. "If I had to guess, I'd say the second half of 2014," he said. Microsoft will introduce at least one new Modern app before that, however: The company has already promised that Outlook will make it to Windows RT this fall when the final release of Windows 8.1 launches. 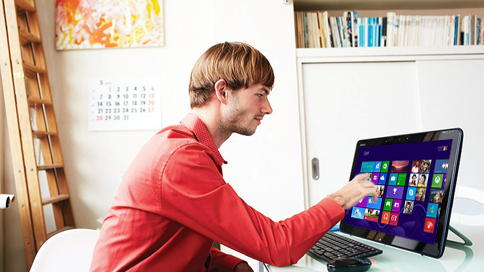 Windows 8.1 can be downloaded today from the Windows Store. Users must first download a small 9MB setup file from the Microsoft website, which will in turn reboot the PC or device, then redirect to the Windows Store for the public preview. This article, Microsoft teases 'Office Lite' for Windows' touch UI, was originally published at Computerworld.com.